While seating the legs fold and don’t offer any resistance, allowing students to calmly release their extra energy, and strengthen their core. But when the children stand up (after the bell rings), the Chair Ball's feet will keep it from rolling away, helping maintain a clean and tidy classroom or homework area. 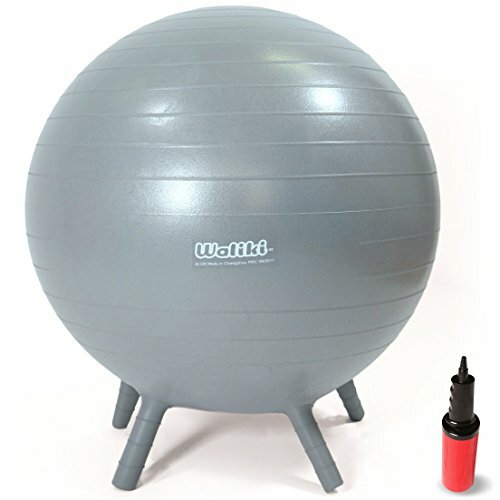 The Exercise Ball with Feet for kids comes in two sizes. 18”/45CM for ages 3-5, and 20”/50CM for ages 8-12. Inflation will determine the final size, enabling students or kids at home to find their perfect fit. Time to reward them? Turn the ball over, grab two handles, and it doubles as a Hopper Ball! ORGANIZED AND TIDY: While seating the legs fold and don't offer any resistance, allowing students to calmly release their extra energy, and strengthen their core. But when the children stand up (after the bell rings), the Chair Ball's feet will keep it from rolling away, helping maintain a clean and tidy classroom or homework area. TWO SIZES & TWO USES: The Exercise Ball with Feet for kids comes in two sizes. 18"/45CM for ages 3-5, and 20"/50CM for ages 8-12. Inflation will determine the final size, enabling students or kids at home to find their perfect fit. Time to reward them? Turn the ball over, grab two handles, and it doubles as a Hopper Ball! If you have any questions about this product by WALIKI, contact us by completing and submitting the form below. If you are looking for a specif part number, please include it with your message.